Have you enabled Emoji on your iPhone to use emoticon-like characters like 13 year-old Japanese girls? Well if you have, you’ve noticed that sending those characters in e-mail and IM to non-iPhone users ends up in little boxes of unreadable gibberish if you’re lucky or whitespace. Most people understand the concept of Unicode if you’re a geek. Someone like my mom doesn’t always remember that Emoji being sent over IM, while she’s on her own iPhone, isn’t going to be readable when I’m on my Mac. We all know, however, emoticons can convey a good portion of a conversation. I don’t want to miss out on the conversation with my mom so I decided rather than schooling her every time “I CAN’T READ THAT MOM”, let’s hack Adium to show Emoji! After a few minutes of research, I’ve discovered, some kind soul has already done the hard work. Go into your Appearance Preferences and customize your Emoticons settings. 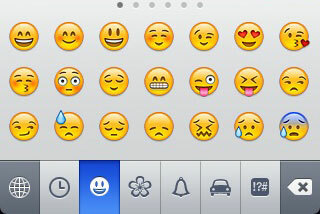 Turn on “Emoji iPhone” and make sure it’s not first in your list. At least one other one should be turned on (like Default). You can click and drag the items in this list – put Emoji last. Now when you receive an IM with an Emoji character, it should present itself as the proper image. You can also select an Emoji character from the list, but be forewarned it’s a BIG list and not presented as cleanly like on the iPhone. I pretty much use it to interpret the incoming characters and for going back in my archives.